Scuba Diving! The word just takes you into the dive to explore what lies beneath the ocean. Having seen in movies and documentary on channels one would think, how cans a common non swimmer could do so? We as humans don’t know how to breathe in atmosphere then breathing under water, just trusting a 10 kg oxygen nitrate cylinder was question to be heard loud. I wanted to do this but never planned, infact never thought it would happen either, till the event came on BTC event. Yes it happened and the day was 4th May 2014 – Netrani Island- Karnataka. The place would be tagged into my grey cells all my life. I don’t know swimming. But sea always inspired me. Being born and brought up in Bombay this is in your veins. Moreover one thing is sure whether there is life in your body or not the sea would always throw you to the shore. J So who cares? Fear was not the reason to think that should I go or not. But rejection or failure in the registration was the only factor of attempt. Yes I attempted and registered. Got through my registration and the next day I got mail from Chaitanya saying doesn’t transfer money to the account as the Event was closed. I was disappointed as this was the fourth time after my first BTC trek at Siddarbetta WOW trek on 4th Jan 2014. 20th April the event was opened and I registered within the same day. 21st the event was closed and till 22nd morning until I got mail from Chaitanya asking if I had initiated the transfer I was not aware that I actually have got registered. I somehow transferred the amount and was keeping my fingers crossed. 23rd May gave a sign of relief when I saw my name in Shortlisted list. I called up my friends in Bombay and told them. But I couldn’t tell it to my family as I would be not allowed. I did tell at home that I am going to Murudeshwar but it was to the temple not for scuba diving. They would have scared me to death and made every attempt to back out. I don’t know how temples become safe and Scuba Diving not even applicable. This was my second BTC. The first was the kick start of my life again to adventure and this event put gears from first to second. We started from Bangalore at around 8:30 pm on 2nd May and reached Murudeshwar on 3rd Morning- 7 am. 3rd Morning was around the temple and the burning under the sun. 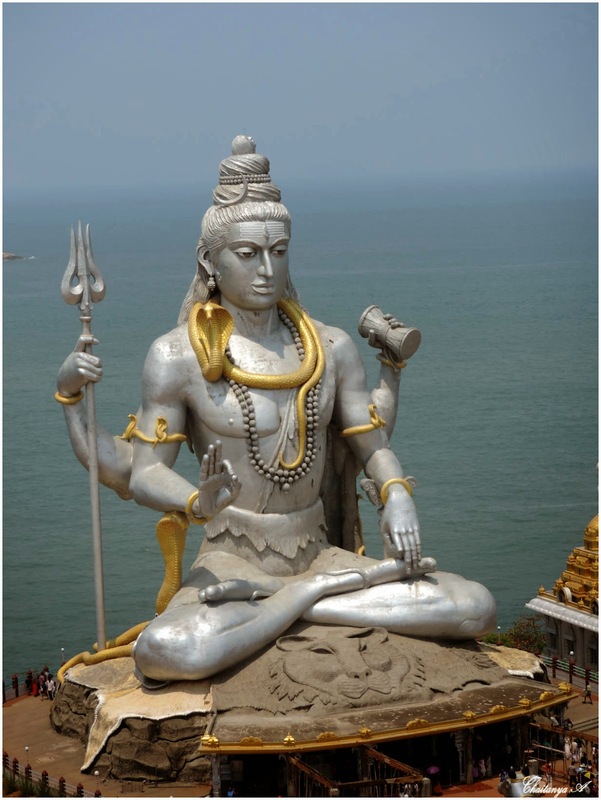 The Mighty Shiva Statue is stupendously gigantic. It does give one a feel that indeed we are looked upon. After a tiring sleepless night in the Tempo Traveler and morning to the temple we all 12 BTC were tired and exhausted. At 4 pm on we left on the beach in our TT. Most of us had meanwhile had become known from complete strangers. Beach was amazing. Serene, Clean and the beach were just with 40 people. And that was the blessing. I couldn’t wait to get into the sea. I was doing this almost 4 years later. The sunset was adding the calmness to the surrounding. Most of us ventured into the waves and it feels great to struggle through the waves and yet to find that you are floating. We were screaming and playing as the wave would hit. We all spent around 3 hours on the beach. Felt as if I had been given that was taken for a while. As the sunset there was high octane and massive whirlpool going into mind about the next day. How will Scuba Diving be and how will it end. Night was again sleepless. We assembled at Dreams Diving at around 9:30 am and after filling the forms started a 10 am in a ferry to the destination Netrani Island. 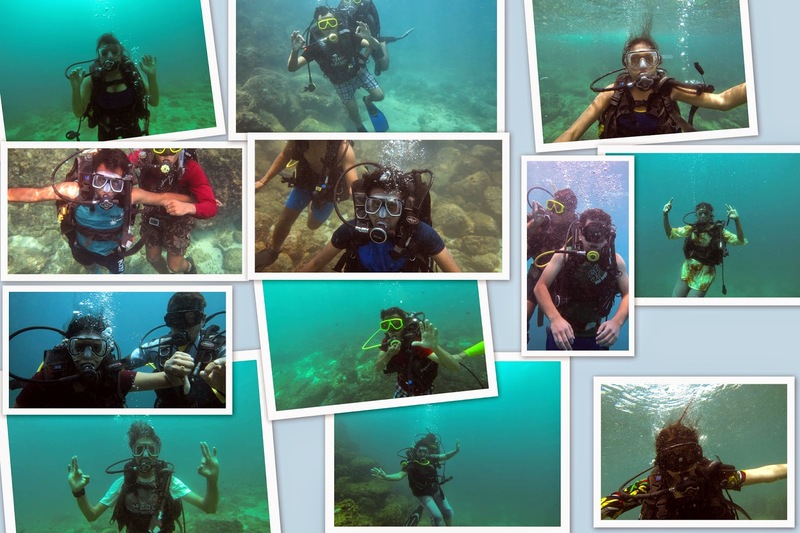 It is around 18 Km and one among the three Scuba Diving places in India. Goa and Andaman is the other two places. In the ferry itself we were given instruction as in what to do and what not to do. Signals and every required information to start were shared. We reached Netrani at around 12 pm. Weathers seems good and waves were not high. Sea was calm. As the first three people went Scuba Diving I went floating with my life jacket and that helped me when I did the scuba diving. Playing around in the clear and transparent water was experience in all. I could see the sea bed and fishes with all the colors. First time I could see something what I saw in Fish tanks. This was more real and picture perfect. And after a 50 minutes snorkeling and floating I decided to go for diving. As I was put with my gears and tanks I just breathe to make myself calm. I wanted to live those moments down 10 m into the sea without being tensed. With blue fins on my feet, a 11 kg breathing tank on my back and a waist belt and a lot of pipes and press button I was told that I need to use these. I had no idea when I can use it. So I had no worries as instructor was there all the time. I felt as I was one among the Armageddon. I think I should even think of a space trip now J . I was asked by a guy on the boat to sit on the edge as the dive is always back flip. So they just hold your legs and push you anti clock wise into the sea. I did sit on the edge and he did what he was good in without noticing that instructor was down there where I was pushed. As I landed I could see my tank hit his shoulder and my feet fins on his face. The start was terrible. I managed to float and the first signal in water was to ask the instructor ‘Are You ok? All well he said. Twice I struggled with my ear pressure as I couldn’t equalize. I had to come out of water. Third time I learnt the tricks and this time I went inside to stay there for the next 25 minutes. I started breathing slowly and as I opened my eyes to the world that I never lived. I was not known to myself for that next 25 minutes. I wanted to go deeper to explore. As I came down meters by meter till I walked on sea bed, I realized how different and blessed it is to live a small amount of life into a world which is not yours. I guess Jake from Avatar Movie might have felt the same. 25 minutes from atmospheric life to aquatic life is breathe taking experience. As I moved among fishes and unknown sea fauna I realized that there is a world that is more amazing and beautiful as ours. I could connect my mind and soul. There is amazing balance that you find as you breathe and float. You just forget where you belong. And once you venture out of the sea bed you know that you have seen and done something that would inspire you all your life. It’s just not achievement or a challenge that you completed it is something that made you complete. The world that is earth, water and air imbibes you within. I found a new self and that 11 more beautiful people was added to my friends list says it all. I thank BTC, Chaitanya, Veena, Sonali & Sonali , Sushmita, Divya, Hareesh, Jeevesh, Vishnu, Vishal, Veera, for all the effort, fun and excitement that they put in. It won’t have been Memorable without you guys. We rocked! Thanks . And hope we get back soon.